This card is a great example of why I like Tarot. It has layers of meaning and subtleties beyond the obvious. When we see “The Lovers” our first thought is the obvious – romantic relationships. The stereotype often holds true. Intimate, intense relationship is a deep, innate desire for all adult humans. Certainly physical attraction is part of it, and this card can speak to an intense one on one, mated, lifelong, committed relationship. But it can also symbolize any passionate, committed relationship, with or without the physical aspects. Nuns and Monks for example. That is about an intense relationship elevated beyond social and physical stereotypes. This card is about the love of your life, whatever, and whomever, that love might be. It can be just that simple, and just that obvious. 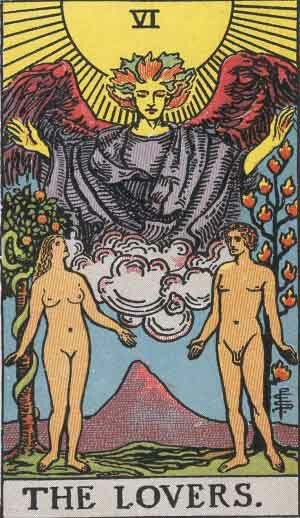 The balance in this card is about desire and detachment. Both desire and detachment have positive and negative effects in our spiritual life and our relationships. Too much desire and it can become a crippling need, an endless black hole of need that gives nothing back to other person – in essence ending the relationship. Relationships, romantic or otherwise are mutual, symbiotic, give-and-take things. Too much detachment and the relationship dies of starvation. Even if we move a step back and look at this from the perspective of non-relationship desires (career goals, material wants, that sort of thing) the same balance applies. Wanting something too much keeps our focus too small. Our expectations become both so high and so specific that all sorts of wonderful things fall off the edges of our radar, so to speak. We are disappointed because X didn’t happen all at the same time we are missing Y – which is just as good if not better. On the other hand, if we are too open, too lackadaisical, we don’t do our part. Good stuff falls off our radar just from not looking at the screen. Desire isn’t a bad thing…it motivates us to act. It motivates us to love and to care and to engage. It’s when desire goes mad or goes missing that problems come around. The connection between all types of desire and the Lovers card makes sense. Desire is at its best when it motivates us to love.